The Watford utilises a smart design that will make it absolutely perfect for you – it is ideal if you need to make intelligent use of the garden space available to you. It has been designed to sit across the rear of the garden boundary so that you can enjoy a large log cabin that doesn’t take up too much space at the back. It is 8.5m wide and 3.5m deep, allowing you to maximise the width of the cabin. 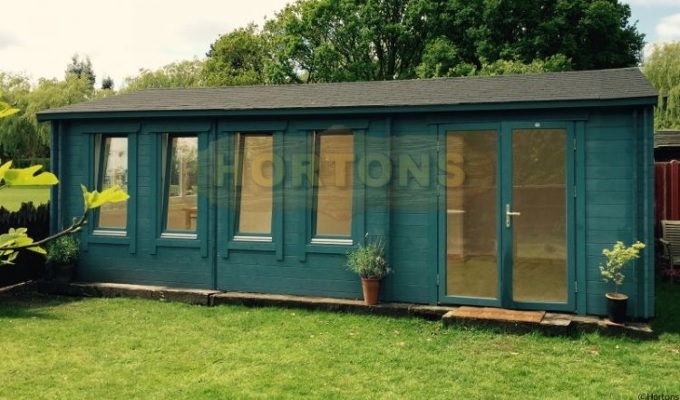 With double doors and opening windows, this is a handsome cabin that is available in a wide range of colours. It can customised entirely to suit your requirements with felt roofing and shingles available. The Watford sits as a lovely feature in your garden and is much nicer than looking at the boundary fence! With plenty of light from extra deep windows, the cabin can be used for everything from DIY to simple relaxation. This cabin allows you to get everything that you need without having to compromise or unnecessarily using up garden space. If you’re interested in the Watford or any of the cabins that we currently have available please don’t hesitate to get in contact with us today – our experienced team will be happy to provide you with any information you need.